Designing basics: how to work with the existing landscape, not against it. A golf course’s quality is often defined by the playability and aesthetics of its landscape, but maintaining that quality is difficult when vast areas of turf are under constant assault from golfers. Water conservation on golf courses begins by addressing the issues of resource management. It’s not simply about “going green”, but rather about creating sustainable solutions that are sound economically and enhance environmental stewardship. The environment should serve as the foundation for golf course design, creating a course that blends seamlessly into its surroundings. To reduce irrigation demands, routing should respect the lay of the land and take advantage of the topography, so the golf course can be compatibly integrated into its setting. By working sympathetically with the existing landscape, not against it, designers can lay a course lightly on the land and create an engaging golf experience that’s inseparable from its environment. Designing a golf course around existing drainage patterns is key to efficient water retention and conservation. By properly utilising the topography, golf holes can work in concert with surface drainage patterns and avoid excessive or poorly oriented slopes. By analysing where and how surface runoff will move on a site, the course drainage plan can include grass swales or diversions that direct stormwater runoff from the landscape to collection and storage ponds to serve either as a primary or supplemental supply source. By far one of the most impactful ways to conserve water is through turf conversion or reduction. This has seen clubs take several approaches, from installing artificial turf on driving ranges, to planting drought-tolerant landscaping around bunkers and converting turf from cool to warm season grasses. Select turf grasses that are most suitable for the micro-climatic conditions of a site, and specifically drought and stress resistant. Preserve and incorporate areas of existing indigenous vegetation that require no irrigation into the design of a course. Utilise indigenous grasses in the secondary roughs and out of play areas to reduce, if not eliminate, the need for irrigation. 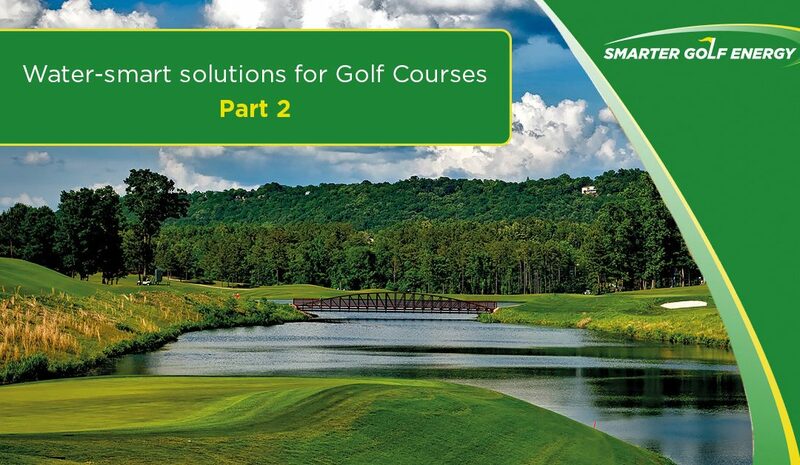 Working with the existing landscape is just one of the ways golf courses can save energy. Be sure to keep a look out for our next blog post in this series on our top five water conservation solutions. You can also contact us directly for expert advice and water-saving strategies.